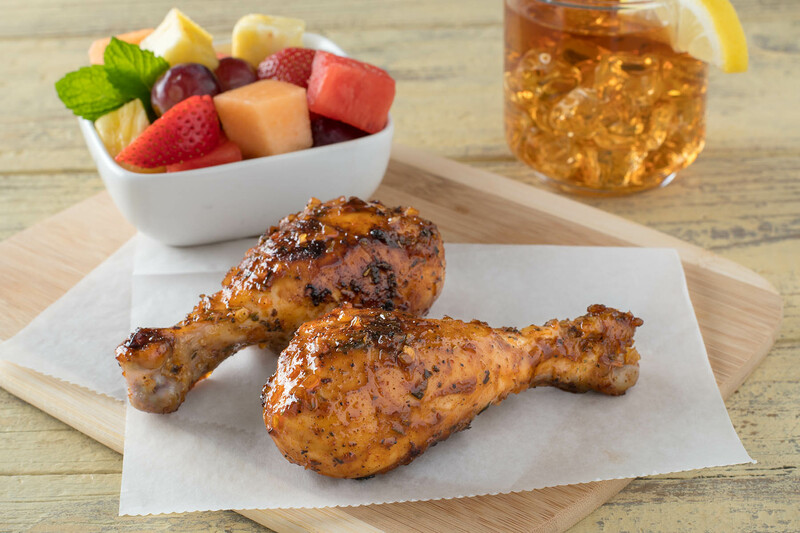 These fruity and sweet drumsticks are perfect for summer and can be served with a fresh fruit salad as a healthy sidedish. Whisk together lime juice and honey in small bowl. Stir in remaining marinade ingredients. Transfer mixture to a zip-seal plastic bag. Remove and discard chicken skin. Add chicken to bag and seal. Refrigerate, turning bag occasionally, for at least 30 minutes or for up to 24 hours. When you are ready to cook, prepare grill. Position grill rack about 6 inches above coals. Stir together chili powder, paprika, salt, and pepper in a small bowl. Sprinkle over chicken. Place chicken on grill rack over glowing coals. Grill, turning occasionally, for 30 to 35 minutes or until chicken is thoroughly cooked. 1/2 teaspoon jarred minced garlic may be substituted for minced fresh garlic.